The world fell in love with her as Lucy Ricardo, a 1950s New York City housewife who got into numerous shenanigans, with her best friend while chasing stardom, trying to appear alongside her musician husband or plotting other show-business ventures. I Love Lucy cemented Lucille Ball’s status as an entertainment legend and comedy pioneer, but she had already been a seasoned performer in the industry for years. She struggled. She cycled through many types of roles and hair colors searching for her niche. Her personal life became her professional life. She experienced painful failures and tremendous successes, throughout her career, in varying order. Lucille Ball’s life and work are reminders that the route to success is often like a jungle gym and not a straight path. Here are some other things we love about Lucy that will hopefully inspire you as you make your way on your own jungle gym. The criticism was hard to take but she stayed in New York, changed her name to Diane Belmont and found some success in front of the camera working as a model. She also tried to make it on Broadway as a chorus girl, but that venture proved disappointing. Ball was fired from four shows and acting coaches echoed the same discouraging sentiments from her teen years. Yet Ball’s love of the craft mattered more than the noise of other’s opinions. Undeterred, she remained focused and kept plugging away but coping with rheumatoid arthritis and the constant hustle of show business wreaked havoc on her body. To regain her strength, she took a bit of a hiatus and after two years, she returned to New York as the original Lucille Ball. She continued modeling and eventually got an opportunity to appear in a national advertising campaign for Chesterfield Cigarettes as a “Cigarette Girl.” After which, she was finally given her first role in a feature film. But she was still a long way from finding her place in Hollywood. Studios considered her too “hard” looking to be a Hollywood starlet with Ball, herself, allegedly saying, “No matter how I get dressed up, I always look like a cigarette girl at the Trocadero.” Despite insecurities surrounding her striking looks, Ball’s talent shined on-screen in moments of silliness and slapstick. Between the 1930s and ‘40s, she appeared in over seventy films yet most of them were not blockbusters. Thus, she was given the nickname “Queen of the B movies.” Unfortunately, the attitude of major studios at the time centered around the belief that funny women don’t sell tickets, beautiful women do. So, her talents went largely unnoticed early in her career, but every B movie was preparing her for the role that would eventually make her one of history’s most important women in television. While her husband, Desi Arnaz, was touring, Ball landed the lead role in a radio show My Favorite Husband. Working in radio required her to cater her performance to a live audience instead of a camera. Her facial expressions and expert comedic timing, that would later become her trademark, had audiences in fits of laughter. Her work on My Favorite Husband would evolve into the role she was born to play. Lucille Ball and Eleanor Roosevelt during a tour of Washington, D.C.
She was a damn smart businesswoman. When CBS offered to turn her radio show, My Favorite Husband, into a television show, she agreed under the condition that her real-life husband would be cast as her spouse. However, as the 1950s were rife with discrimination, CBS wasn’t on board and didn’t think American viewers would accept her character being married to a “foreign” man. Lucy stood firm in her decision and refused to do the show without Arnaz as her husband. But, she still wanted to break into television, a new media then, so she and Desi formed Desilu Productions and took their show on the road to prove to the network that they were a solid comedic duo. Arnaz already had a successful career as a musician, touring with his rhumba band. He and Lucy wrote and incorporated vaudevillian material into performances by the Desi Arnaz Orchestra. Their skit ended up being such a hit, it not only sealed the deal with the network, making Lucy and Desi TV’s first interracial couple but was also written into one of the early episodes. As one of the founders of Desilu, Ball became the first woman to run a major Hollywood studio. She knew how much influence television had over mainstream culture and wanted to be conscious about how stories were depicted. One of Lucy’s most important on-screen relationships was with her best friend, Ethel, played by Vivian Vance. True partners in crime, the characters of Lucy and Ethel have become synonymous with friendship in modern culture. Much of the show’s success can be attributed to their supportive and playful antics. Who can forget that iconic scene at the chocolate factory? Get inspired by some of our favorite interviews, featuring Dolly Parton, Solange, Tina Fey, Jessica Williams, Kathleen Hanna, Laverne Cox, the Broad City gals, and more! Plus, keep up with the latest from BUST. I Love Lucy also featured the first pregnancy shown on TV. Coincidently, the episode where Lucy gives birth to Little Ricky aired the same night Ball gave birth to her own child. She struggled in her marriage, but she kept moving forward. Ball knew Arnaz had a habit of flirting with other women and drinking too much while on tour. This was even one of the reasons she was so insistent on having him play her husband on the show. She thought having a family would mean the end of his unfaithful antics but things unraveled. While she could escape into a world with a loving family on set, the façade fell apart once the cameras stopped rolling. After I Love Lucy aired its final episode in 1957, the couple produced a spinoff called The Lucy-Desi Show. The show was short-lived and didn’t come close to the success of I Love Lucy. It was canceled in 1960, the same year the couple announced their divorce. The period after their divorce was said to be the darkest of Ball's life. Their lives and career had been intertwined for twenty years. The divorce not only felt like a personal failure but a professional one as well. Lucy felt she had disappointed the American public by not being able to replicate the show’s happy ending in real life. Ball bought Arnaz’s share of Desilu in 1962, making her the most powerful woman in television at the time. We actually have her to thank for Star Trek! When CBS turned down the Star Trek pilot due to the high budget, Ball stepped in and gave the production the necessary financial backing, ensuring the pilot would be produced. We all know how they turned out! Ball also thought she’d retire from acting after The Lucy-Desi show but she loved her work and wanted to include her children. She would appear once again on television in Here’s Lucy, which featured both of her children. While she and Arnaz had a nasty divorce, they remained friends and both remarried. Her marriage to comedian Gary Morton lasted 25 years until her death in 1989. Lucille Ball not only paved the way for women in comedy but also for women in business and production. Ball played a pivotal role in shaping the history of television. Her unique legacy as a multifaceted performer and businesswoman continues to thrive. I Love Lucy lives on in households and new fans of the show are born every day. Taraji P. Henson On Committing To Her Relationship, Ignoring Her Age, And "Seeing Her Money"
Hi there! I’m a comedian, writer and actress living in New York City. I’m the only person to have a subscription to Nickelodeon Magazine without access to the Nickelodeon channel. My favorite movie is George Of The Jungle. Follow me on Twitter and Instagram @stonecoldvolpe and check out my website francescavolpe.com for more of my writing and silly videos! Support Feminist Media! During these troubling political times, independent feminist media is more vital than ever. If our bold, uncensored reporting on women’s issues is important to you, please consider making a donation of $5, $25, $50, or whatever you can afford, to protect and sustain BUST.com. 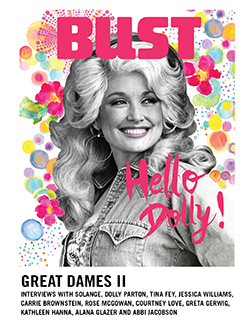 Thanks so much—we can’t spell BUST without U. If our bold, uncensored reporting on women's issues is important to you, please consider making a donation.